Instead of another meal at Braise or Chinois by Susur Lee (although I suppose I could have given Il Lido another try), I thought I would try something new after coming across a restaurant in Sentosa's directory named "Suburbia", and I was rather tickled by the restaurant's setting in the beautiful surroundings on the fringe of Sentosa golf course. Nestled against rolling hillocks, the scenery is so pleasant that the majority of the restaurant is in fact dedicated to al fresco dining, which can be a little daunting at night when squawking cockatoos fly overhead. As with all outdoors dining, however, I can well imagine that the pleasantness of the experience will largely be dictated by the vagaries of the (recently very mercurial) weather. My appetiser of cream of wild forest mushrooms was thick, with coarse bits of mushroom adding both texture and flavour. Having said that, though, I did think the soup could have been thinned out with some vegetable stock, so as to produce a smoother, more liquified offering. S had the Lobster Thermidor, which had been sauteed and then, it would appear, baked with hollandaise sauce and grated parmesan cheese, and served with new potatoes. S had no complaints about how the dish tasted, but I felt that in terms of presentation, more effort could have gone into sprucing it up: the lobster was meant to be the star, it was true, but it looked naked and, ironically, lifeless as it lay forlornly on the stark white plate. I ordered the honey-spiced French duck breast, as I was intrigued by the "caramelised Sarawak pineapple", with pink peppercorn and grand marnier sauce. I suspect this was a local interpretation of duck a l'orange, but there were a few little hiccups with this dish. First, although the helping of duck was very generous indeed, I thought the duck breast was a bit tough, which was an indication that the duck was a little old. Second, apart from a thick round of pineapple sitting at the base of the dish, there wasn't much pineapple flavour to speak of. Third, I wasn't sure that pineapple was a suitable substitute for orange, as unless the pineapple is unripe, it tends to be much sweeter than it is sour, and the characteristic tanginess of duck a l'orange is lost. Still, it was a valiant effort. All in all, Suburbia is a pretty decent place to have a meal in Sentosa if you're not looking for something that's too fancy, and while it may not measure up to the more impressive offerings in Resorts World Sentosa, there's no reason it can't be considered for a nice family meal. Z. and I have been trying to eat more vegetarian these days, he is vegetarian almost completely (although by choice) and this decision was bourne out of his belief that the modern ways in which we farm animals is unhealthy and overly hormonal, as well as a need to be lighter and more clean-eating. He does have one meat day a month and I haven’t converted completely, nor do I think I would, but I do eat much more vegetables and much less, in particular, red meat then before. And no, it’s not the same, not even remotely so, vegetables don’t have the density and deep taste of meat, eating no meat makes me slightly grumpy and tired. Being vegetarian, even part-time, is not at all easy, this is particularly for home-makers or women cooking for a large household. To be committed to it, you really have to overhaul not just the way that you cook but also the way that you grocery shop and stock your home. This is compounded if you have some people who eat meat and some people who don’t, or if you only have vegetarian food say, twice a week. One solution, I suppose, would be to eat meat if you wish, at lunchtimes, when you eat outside the home, but then just cook and stock vegetarian food at home for dinners. A few things that I’ve come to notice, you need to change the sauces you have, of course, no seafood product and not as many meat-related sauces. Obviously, it takes awhile to slowly replace your pantry and it’s not always healthy, because it’s not easy to get vegetables to taste good. Many vegetarians just default to carbs, like oily Hokkien Mee, or worse, instant Maggi noodles. change is that you have to be properly set up for more steaming, if you don’t want to be perpetually eating stir-fried or roasted food or eggs, all the time. Eggs aren’t exactly that healthy, you won’t be ingesting as much fat as meat but probably just as much cholestrol. You definitely need to learn more tofu recipes, incorporate more beans, nuts and fruits in food, to find different tastes and textures without compromising on oil or sauces for flavours. So being vegetarian, really takes a lot more time and effort but I suppose even that would remind you to be more concious and aware about what, and how much, you are eating. 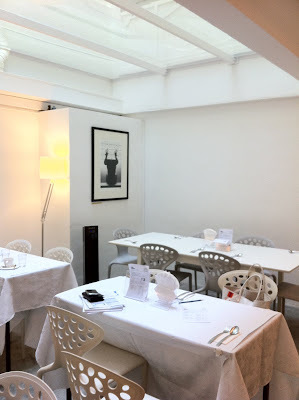 This recipe was something that I came across from Ottolenghi, one of my favourite places to eat in London. He is well known for encorporating world flavours, particularly vegetables and herbs, into his recipes. His recipes also tend to have many ingredients, so I’ve tried to simplify it. I would definitely put in the Compte, as it lends a very distinctive taste to the tart. Ottolenghi suggests using swiss chard but I had spinach, so I used that. I jumped on the chance to make this because it’s a good recipe to use up salad leftovers- I had a lot of fresh baby spinach, so I chopped and wilted them gently in a pan, if you do something similar, remember to squeeze out the moisture. I also added olives, shitake mushrooms and sun-dried tomatoes because I had some and omitted any salt from the recipe, as the two ingredients are naturally salty. If you are really hard-working, you can also caramelize white onions and add them in. Heat the oven to 180C. Place a circle of greaseproof paper on top of the pastry case, fill with baking beans and bake for 20 minutes, until just golden. Remove the paper and beans, and bake for another 10 minutes, or until the pastry is cooked through. Remove from the oven and reduce the temperature to 150C. While the pastry is cooking, mix together all the filling ingredients except the spinach, then pour into the cooked tart case and dot with spoonfuls of spinach. Bake for 30 minutes, or until the tart is just set and golden. Leave to cool for 10 minutes, remove from the tin and serve warm. 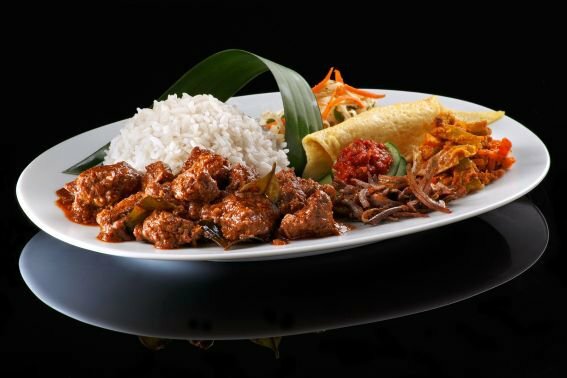 It seems like new places to eat are springing up (and perhaps also shutting down) in Singapore faster than overnight toadstools. One specific kind of "new place" is a remake of old favourites from hawker centers and the one that I visited last week was particularly delicious, as you can see from their profile pictures. This is usually spearheaded by a member of the more-corporatised younger generation, who's gone to business school or left some fancy banking institution to modernise the family business. Funan Weng, formally from Ghim Moh food center and now in Tanjong Pagar's Maxwell Chambers is one such place. Wok and Barrel, a charming little eatery I was introduced to in Duxton Hill, is another such place. Wok and Barrel used to be a food stall at the Maxwell food market selling Nasi Lemak. Now, they still offer up their delicious fare, except in larger portion sizes, in a hip location and more importantly for Singapore, with air-conditioning. These re-made food favourites trade off a bit of that charred authenticity for a cleaner, more comfortable environment, catering more to professional lunches than everyday meals. Both places have a very simple and organized system for placing orders, a bit akin to a primary school tuckshop. 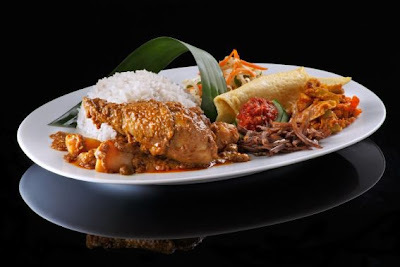 You simply tick off your choice of lunch set, Nasi Lemak with a range of choices, Beef Rendang, Chicken Curry or Crispy Pork and add-ons, like sides of Otak or local drinks, Barley or Lime Juice. In setting up their own eatery, I guess these stores now get the added margin of beverages and desserts but there’s probably a trade-off with volume, especially in areas like Duxton Hill. 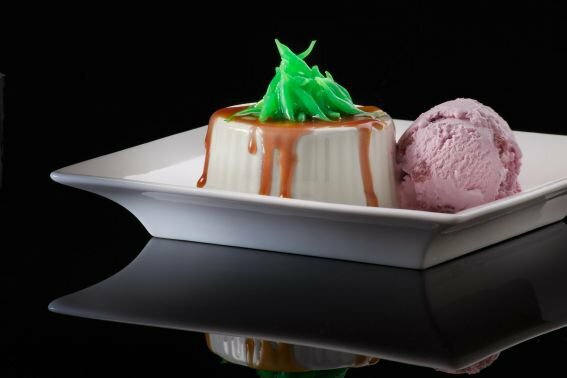 Their two signature desserts are gula meleka panna cotta with red bean ice cream and sticky toffee date pudding. 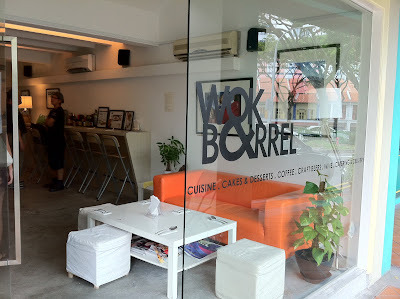 Wok and Barrel seemed to be doing a brisk business and I would definitely come back with friends. 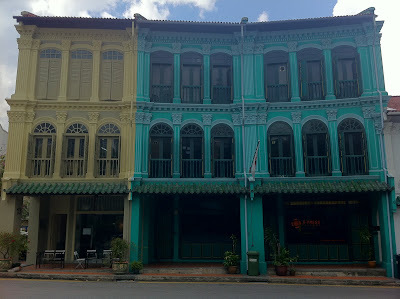 The area is gorgeous, just off the pedestrian-only Duxton Hill shophouse area if a little quiet and inaccessible particularly for lunch. If you come for dinner, they have a trendy fusion menu which includes local bah chor mee pastas and banana crack parfaits. 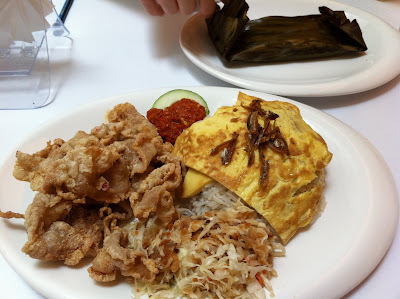 The food is well-prepared, I tried the Crispy Pork, which was a little un-crispy for my taste (it was a bit like floured, fried bacon) but still very good. Each set comes with an omellete, ikan bilis, cucumber, sour shredded vegetables and coconut rice. A word for the purists though, I am not a fan of overspiced chilli, nor of achar and I could happily eat both, which means that it wasn’t very hot or “shiok” as some of my chilli-fanatic friends prefer. Although it was a fairly small run, for family and friends, it was the first time I got to bake in awhile and it really felt great. I'd forgotten how therapeutic it was, weighing out the butter, sugar, flour, toasting the nuts and folding the batter and citrus peel into a rich, moist crumb. The smell throughout the house was really heavenly and the stack of honey-brown, brandy-brushed cakes has been flying off the shelves! We managed to get these lovely photos to share of the entire, delicious process. Thank you for all your support and feedback and have yourself a Merry Christmas! I'm not going to moan on about work again, I promise, but what does it say that as the early days of winter darken, I am *finally* posting the last of the rhubarb series, which I made into a lemon rhubarb cake. After looking out for it this year, I realized that one can find rhubarb in Singapore after all, it is sometimes available at Cold Storage and Jason's, however, it is not fresh, turgid and thick like in England but a rather sad, scrawny version. I just used a simple lemon Cake Recipe, from the Barefoot Contessa Ina Garton's Party Ideas and added the chunks of rhubarb to the batter before baking. I also like to replace 1/2 a cup of flour with ground almonds (or hazlenut/almond mix, leftover from macaron baking) and I added another contraband, poppy seeds. 4. Sift flour, baking powder, baking soda, and salt. 5. Combine 1/4 cup lemon juice, buttermilk, and vanilla. 8. Pook holes all over cake. Cook remaining sugar with lemon juice and pour over if desired, if not, sprinkle lemon juice over cake while it is baking. Tha family ate this one up and I really savoured the mixture of the citrus kick with the slight vegetal bitterness of the rhubarb. Till next year, my beauties! 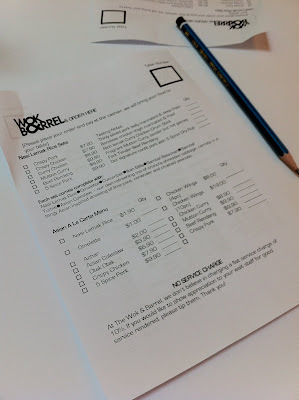 While we usually don't reprint content, this list by David Leibovitz was just too brilliant not to share. The original article can be found on his intelligent, educational bloghere. "In the reverse direction, outside of France you’ll often pay hefty prices on French-made items; certain goods one can buy in France quite cheaply. Of course, shipping, exchange rates, taxes, and other costs figure in to those prices when you see them in a store in New York City, but if you’re coming to France, here’s a few things you might want to check out. I didn’t include things like chocolates, macarons, or other obvious things simply because, well, they’re pretty obvious. For bringing stuff back, although you can buy zip-top freezer bags in French supermarkets, the very heavy ones aren’t available, so you might want to bring a few from home for securing whatever you schlep. Bubble wrap and packing tape are not easily available, so you might want to pack a few sheets along and a small roll of tape if you plan on buying things in glass jars to carry home. I slip small jars into socks then put them into shoes in my suitcase, which cushions and protects breakables. Wine and some cookware are cheaper in Paris, but they’re hard to carry, especially with luggage restrictions. Certain French companies manufacture their cookware in Asia so it’s not always a bargain to buy it France. (Plus you always pay a 19.6% tax on all purchases in France.) If you’re a wine or absinthe collector, perhaps it’s worth carrying bottles back; La Poste sells boxes specifically for shipping wine, with Styrofoam inserts for two bottles. The rules are constantly changing about what you can and can’t bring back to your home country. So it’s always best to check the website of your government customs agency for the latest information. Few countries allow fresh fruits, vegetables, or meats to be brought in from other countries unless they’ve been heat-treated, which means sealed in a can. Jars are iffy and are sometimes confiscated. At present, you can’t bring things like mustard or jam on the plane, and I’ve heard third-hand accounts of chocolates from La Maison du Chocolat and Ladurée macarons being taken away at security. The rumor is that they know what boxes to look for, take them away, and then eat them. 1. Mustard: I like Edmond Fallot mustard quite a bit (you can find it at swanky prices in gourmet stores like La Grand Épicerie, or at normal prices at G. Detou), although when I first moved to France, I had my groceries in a sack coming home from the supermarket, and I had a giant jar (think a quart) of Amora mustard in there, since it was so inexpensive. A woman sitting next to me, said, “Très bon…et très forte!” (“Very good…and very strong!”) If you don’t want to mess with jars, mustard is also sold in plastic squeeze bottles as well. 2. Salt: I’m a salt chauvinist and although it sounds elitist and annoying, I really do use exclusively French salt. And that’s not just because I live in France. I get salt whenever I travel. But no matter how many little bowls of white, gray, and whatever-colored crystals are lined up on my counter top, I always reach for the little bowl of French salt first. The last few years, fleur de sel de Guérande has been in short supply because of untimely rains, when the salt was supposed to be harvested. But you can find it in certain shops and markets, as well as its cousins, fleur de sel de Noirmoutier, Île de Ré, and from the Camargue. Depending on where you shop, and the provenance, a 125g (4 ounce) container costs between €3-€5 in France. The price is about double elsewhere. Coarse gray salt is a bargain in France, too, and just about every supermarket sells it for roughly €1.25-€1.50 for a 500g (about a half pound) bag. I buy it and grind it myself in a blender or mortar and pestle, and use it for cooking and baking. 3. Biogaze: When I worked in the restaurant business in San Francisco, I worked with quite a few French people. And in the restaurant business, as you can imagine, there were quite a few burns. After one of my French co-workers took a trip back to France, he returned with several packs of Biogaze, saying it was great for treating superficial minor burns. And sure enough, these pre-moistened layers of gauze are great for kitchen brush-ups with heat. A pack of ten costs approximately €9 and you can ask for them at any pharmacy. 4. La Roche-Posay Sunscreen: For many years, the FDA would not allow these amazing sunscreens to be sold over-the-counter in the US. But I saw them on shelves on my last visit, selling for a whopping $29, plus tax. In France, my favorite sunscreen is the Anthelios XL (the ‘fluide’ one is for the face; the others are thicker lotions) and costs about €11. It’s extremely liquidy and feels like water going on, so there’s no gunky, creamy feeling meaning that you can wear it without feeling like you’ve got a layer of pastry cream on your face. Depending on the season, stores like Parashop, which are all over Paris, often discount it or put it en promotion. 5. Lentils from Puy: Until regular lentils, these compact, sharp-edged lentils are grown in volcanic soil and allowed to dry on the stalk. Their terroir gives them a minerally flavor. But what’s even nicer is that they don’t turn to mush when you cook them. About 25 minutes in boiling water with an onion half, a bay leave, some thyme, and maybe a few chunks of bacon. Drain, season, and serve. Or add tiny cubes of cooked carrots, celery, and fennel, let cool, and toss in some crumbled goat cheese and nuts—voilà, the perfect side dish or lunch in about half and hour. I always keep a bag on hand and they’re about one-quarter of the price in France than they are outside of France. Most well-stocked supermarkets sell green lentils and although you can find regular green lentils easily, if you see the lentilles de Puy, grab those. 6. Kitchen Gadgets: Although large cookware is unwieldy and not always a bargain in France, small gadgets and paring knives, especially those made in France, are. Outdoor markets always have stalls of people selling everything from Opinel knives to little tartlet molds. Yes, you can buy them at the specialty shops around Les Halles, but they’re not selling madeleine molds for €2 or wooden-handled Nogent paring knives for €5. If you’re not able to hit the market, La Vaissellerie, which has shops all over Paris, also has quite a few kitchen gadgets available inexpensively. 7. Christine Ferber Jam: Every American I know goes nuts over these jams and jellies from the famed Alsatian jam-maker Christine Ferber. I make my own, and as much as people want to quiz me about which one to buy, I’ve only tried one or two…but her flavors sure look tempting. And I know many a folk who’ve returned home from their trip with a lone jar, who write frantically wondering where they can get more in America. (You can’t.) The best selection is at La Grand Épicerie, however Da Rosa sells them as well, although they’re a few more euros per jar. 8. Salted Butter: Really great salted butter is available in every French supermarket (Tip: Look for one with a blue and white label and aux cristaux de sel de mer, or ‘with sea salt crystals’) and if your home country allows it, you can bring back blocks of this butter and store it in your home freezer for months. If traveling during non-summer months, I put blocks in zip-top bags and bring them to friends, too. Most butter will survive a several hour trip just fine, but if you bring an insulated freezer bag and ‘ice bricks’ (ask a friend or your hotel to chill it overnight) over with you, you can make good use of them on the return trip. If you want to bring back top-quality French butter, you can buy Bordier butter at La Grand Épicerie, Da Rosa and Breizh Café or Pascal Bellevaire butter, which is pretty great too, at any of their fromageries or La Grand Épicerie. 9. Speculoos Cream: I lugged a few jars of this spread back to the states to friends, and I got notes in my Inbox with expletives from them a few days later, saying I’ve ruined them for life. This gingersnap-like Speculoos cream is a bit of sweet-spicy heaven in a jar. It’s just a few euros in most supermarkets and can be found in the same aisle with the jams and chocolate-hazelnut spreads. 10. Valrhona Cocoa Powder: I hesitate to call for specific brands in recipes when I’m writing them up because 1) it’s frustrating when you want to make a cake and you need to mail-order for something, and 2), Not everyone can afford the same swanky products. However I do find that this French-made cocoa powder is much darker and more flavorful than any other and because it makes such a difference, I’ve found that the results are dramatically different (ie: less intense) if made without it. If you’re a dedicated home baker, you can buy a 3 kilo (6 1/2 pounds) of this cocoa powder at G. Detou for around €35. It’ll keep for a few years in your pantry because it’s packed in air- and light-tight bags. If you’re not a dedicated baker, you’ll be happy to know that it comes packed in three individual bags, so you can split the booty with friends. Bonus #11: Hazelnut Praline Paste—I had to add this one at the last minute because I brought some American friends into the shop of John-Charles Rochoux last week and after they were done swooning over the tiny spoonful offered, they picked up four jars of this spread made of darkly caramelized hazelnuts, using fresh nuts of the highest quality, then ground to a smooth paste. Words can’t describe how good this tastes—just make sure not to put the it in your carry-on: it’d be a shame if the customs officers got to enjoy it, instead of you."